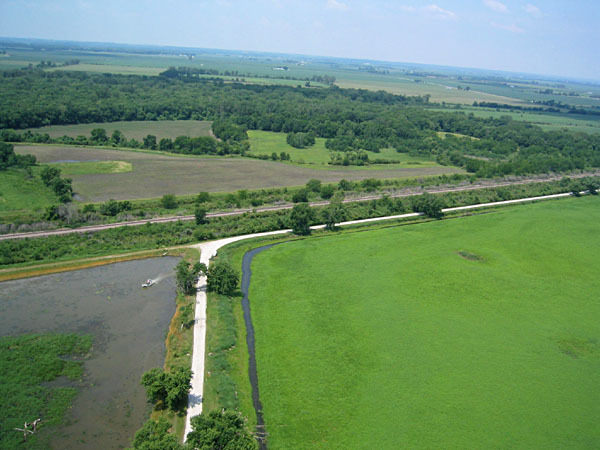 Squaw Creek NWR is located on the eastern side of the Missouri River valley next to Mound City, in northwestern Missouri, approximately 75 miles northwest of Kansas City. Founded in 1935, the refuge comprises 7350 acres mainly in the bottomland and partly along the eastern valley bluff--see refuge map. 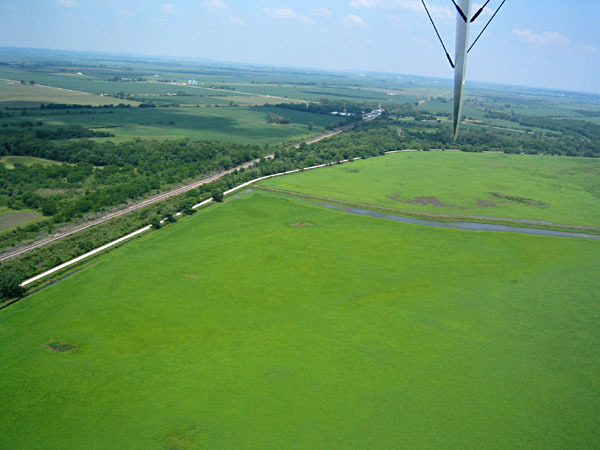 The bottomland includes extensive man-made marshes, reclaimed from former cropland, and the bluff is wooded loess hills. Loess is thick, wind-blown silt and clay derived from the adjacent valley bottom during the ice age. The marshes are managed for shorebird and waterfowl habitat. Bald eagles nest here, and more than 300,000 snow geese and 100,000 ducks stop over during their seasonal migrations. All together the refuge hosts more than 300 species of birds, 30 mammals, and 35 reptiles and amphibians. 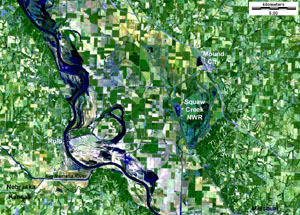 Satellite image of Mound City-Rulo vicinity, Missouri, Nebraska and Kansas. 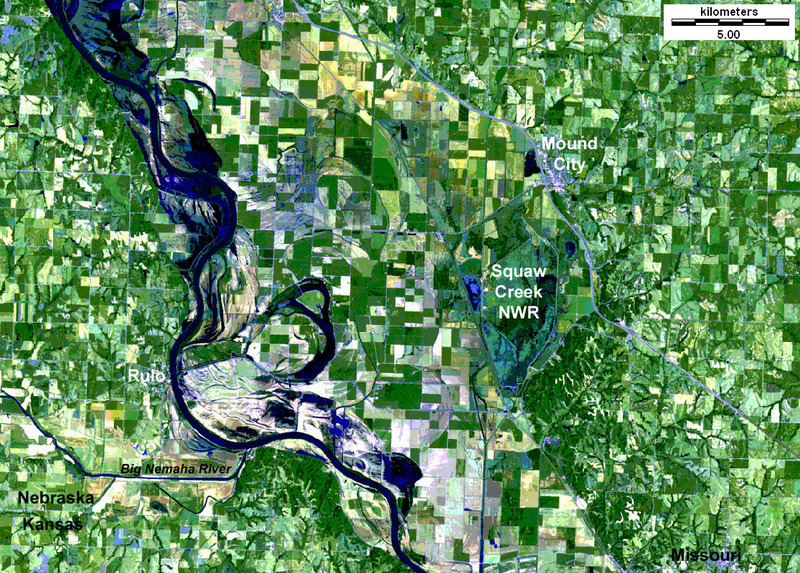 Note the remarkable expansion of the Missouri River bottomland between Rulo and Mound City. Squaw Creek NWR is located on the eastern side of the extra-wide valley. Lewis and Clark camped near the mouth of the Big Nemaha River on July 14, 1804. Landsat TM 257 composite; image date 2 July 1997. The Missouri valley is exceptionally wide at Rulo-Mound City, approximately 11 miles (18 km) across. In contrast, the valley at Kansas City is only about 2 miles (3 km) wide. The difference stems from geologic conditions. The Missouri River at Mound City crosses a buried glacial valley that is filled with loose sediments--sand, gravel and mud, which are easily eroded as the river meanders back and forth. At Kansas City, however, the Missouri River cuts through thick, resistant limestone beds that are resistant to erosion and have maintained a narrow valley. Clark went on to describe the river, meadow, grass and trees. He concluded the artificial mounds were Indian graves and were evidence of a once dense population. 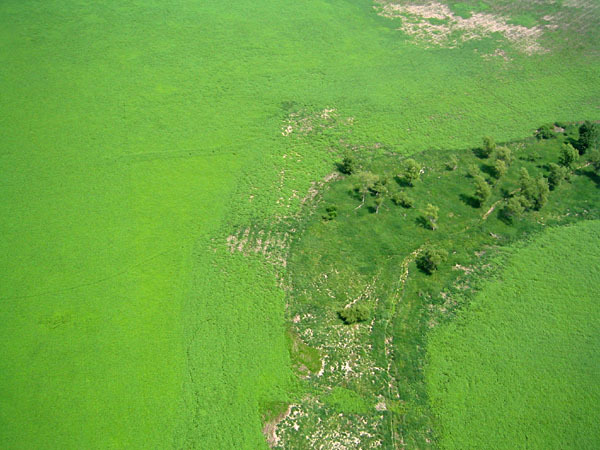 The following airphotos were taken from a small helium blimp in June 2003. The blimp flew approximately 500 feet (150 m) above the western part of the refuge on a hot, humid day under calm conditions. Special thanks to Sara Acosta for making arrangements to conduct aerial photography at Squaw Creek NWR. View westward across the Missouri River valley. Mallard Marsh to lower right; Pintail Pool at lower left. Notice the airboat in Pintail Pool. View toward the northwest over Mallard Marsh. Tail fin of the blimp is visible at top of picture. 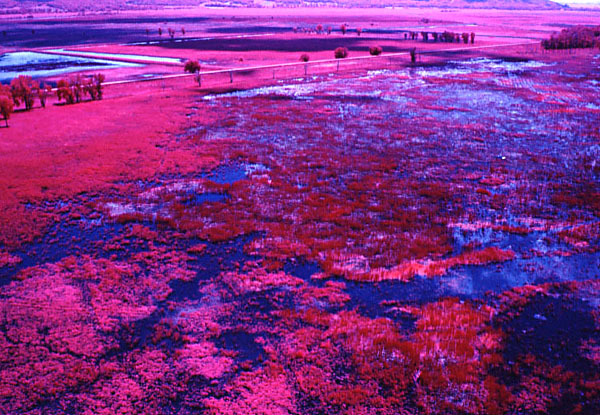 Color-infrared photograph, in which active vegetation appears in pink and red colors. View toward northwest over Mallard Marsh. 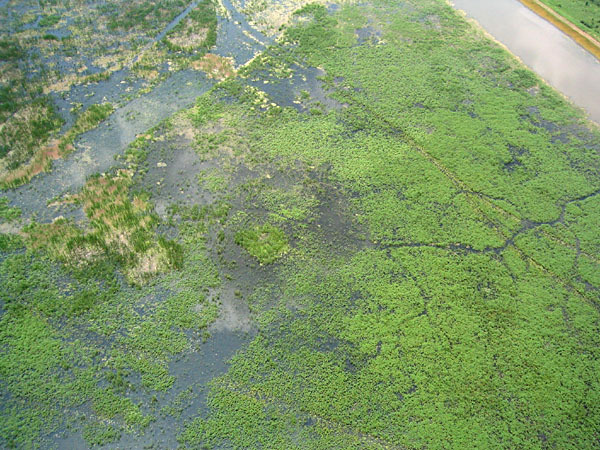 The marsh displays a homogeneous, smooth cover of arrowhead vegetation. 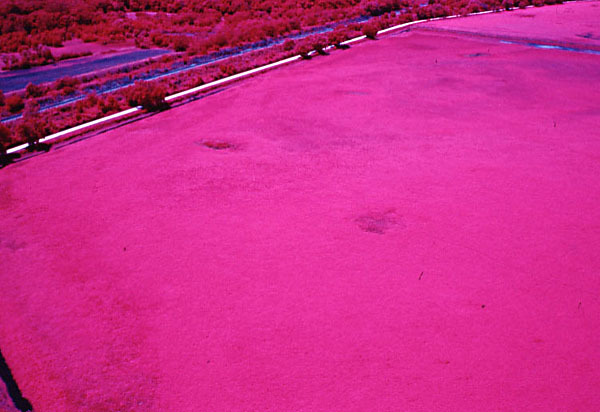 Color-infrared photograph. View toward southeast over Pintail Pool. Note the mosaic of vegetation types and open water. Low-oblique shot of Pintail Pool. The pool was flooded in 2003 after being dry the previous year. It supports a mix of cattail (left) and arrowhead (right) vegetation. The tracks across the marsh are from the airboat. Low-oblique view of Mallard Marsh. Vegetation is a carpetlike cover of arrowhead. The trees (on drier soil) are often used by eagles for nesting. Near-vertical shot of blimp operations on the ground. The blimp shadow appears to left, and sun glints from smooth water to right. Squaw Creek National Wildlife Refuge. Friends of Squaw Creek NWR. Return to Lewis and Clark bicentennial space-age atlas. All text and images © J.S. Aber.